Pencil boxes, t-shirts, jewelry, stationary—Hello Kitty seems to be everywhere on earth. Thanks to seventh grader Lauren Rojas’ science project for Cornerstone Christian School in Antioch, California, the iconic feline has also now been to space. Inspired by a Visa commercial showing a couple of guys sending a balloon into the upper atmosphere, Rojas decided to create her own mission to examine the effects of altitude on air pressure and temperature. Her video of the experiment went viral, and garnered nearly 1 million views on YouTube, making a celebrity out of the student and her beloved Hello Kitty doll. For her journey into the the upper reaches of the atmosphere, Rojas attached a six-foot weather balloon to a plexiglass-topped Styrofoam cooler that she made into a space capsule. Inside she added a Spot GPS device and flight computer wrapped in hand warmers for insulation. The balloon itself was filled with hydrogen, as helium in recent years has become more difficult to obtain. GoPro cameras were attached to the setup, and took video of the entire excursion. The parachute and and flight computer were purchased through High Altitude Science, and the rest of her materials were bought at Lowes and Home Depot. The launch took place in Livermore, California and the ship landed 45.7 miles southwest and 50 feet off of the ground in a tree in San Jose. 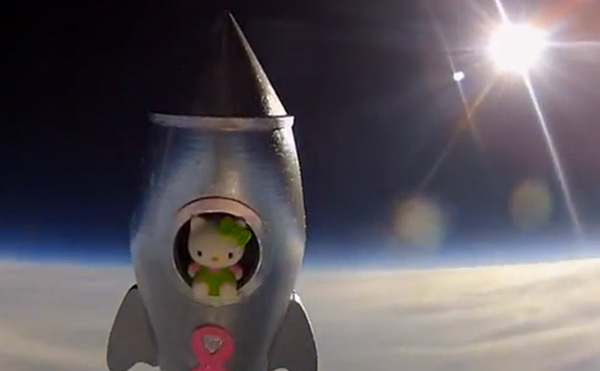 Her Hello Kitty ship reached an altitude of 93,625 feet, at which point the balloon burst, sending it plummeting back towards home ground. Rojas hopes to perform another launch to test out some other atmospheric conditions, but is keeping quiet on the details. One small step for a stuffed cat, and one giant leap for seventh graders everywhere! Pencil boxes, t-shirts, jewelry, stationary—Hello Kitty seems to be everywhere on earth. Thanks to seventh grader Lauren Rojas' science project for Cornerstone Christian School in Antioch, California, the iconic feline has also now been to space. Inspired by a Visa commercial showing a couple of guys sending a balloon into the upper atmosphere, Rojas decided to create her own mission to examine the effects of altitude on air pressure and temperature. Her video of the experiment went viral, and garnered nearly 1 million views on YouTube, making a celebrity out of the student and her beloved Hello Kitty doll.